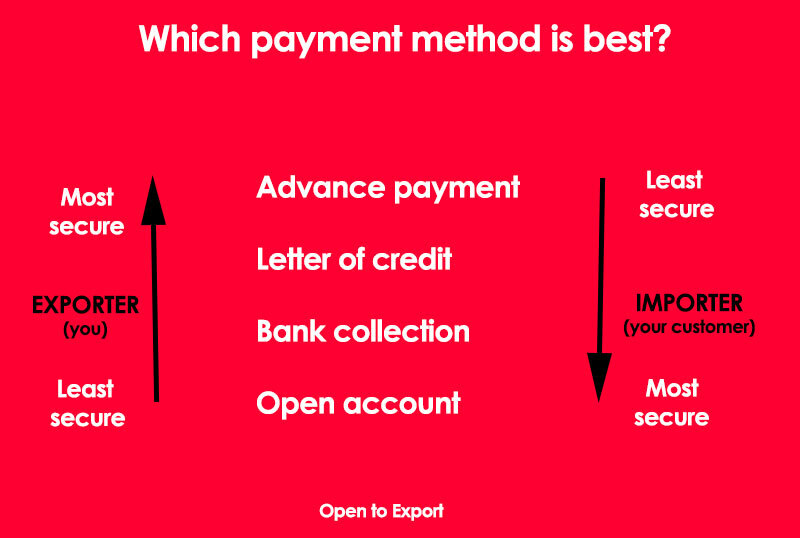 To select on the best payment method, it can be helpful to think about it in terms of the above risk ladder. The nature of the relationship with your buyer may also determine the settlement method used. This is probably the least secure payment method for you as the exporter. Your buyer receives the goods and then pays for them, usually with a credit period attached (30, 60 or 90 days). This payment method extends the period before which your business receives cash –and your working capital position will be impacted further if a period of credit applies. This is a more secure option than an open account, whereby, as the name suggests, your bank collects the money on your behalf. It is also known as a documentary collection. An instruction document is forwarded by your bank to your buyer’s bank for release against either Payment (Documents against Payment) or Acceptance – of a Bill of Exchange (Documents against Acceptance). This can be a good way of “meeting in the middle” with your buyer, wherein the risk is reduced (but not eliminated) for you both. It is also not as time consuming or costly as a letter of credit, and doesn’t take up any credit facilities. A letter of credit is essentially a bank’s promise to another bank that you they know you and (hold your overdraft facility) will act as a guarantor for your transaction. You need both banks’ party to the transaction to agree to act in this way. Once it is agreed, in the event that your buyer is unable to make payment, the bank will cover and pay the outstanding amount, provided that certain delivery conditions have been met. We have another article that covers letters of credit in great detail. One of the important things to note from a payment method perspective is that, if ever you receive a letter of credit, ensure you give it your immediate attention and check it in detail. Remember, it is a document that should lead to your business being paid on time. Lack of attention to detail could delay payment and cost you money. This is the most advantageous method for you as the exporter as, where the buyer has to pay for the goods before they receive them. Consumers essentially do this every day when purchasing online, being charged either at the time of order or when the goods dispatch. You sell a unique/rare product of high value. Ultimately, if you’ve been following the action plan and export journey as set out here so far, you will have a strong idea of why you’re exporting and what your goals are for your business in this regard. You will have recognised the potential barriers to profit and developed some strategies to cover areas of risk for you. You will also have quoted a price that will produce the profit you are after. So, once you have selected the appropriate method of payment, allow sufficient time to get everything in place and make sure you ask questions – of your buyer, if need be, and especially of your bank, who are there to help.